Is there a better alternative to Diffly? Is Diffly really the best app in Editors category? Will Diffly work good on macOS 10.13.4? 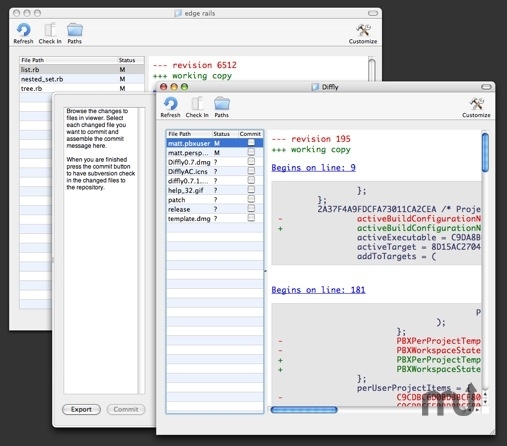 Diffly is a Mac OS X subversion working copy browser. Diffly is my first application written in Objective-C using the delightful Cocoa framework. Despite my inept UI design skills Cocoa allowed me to come up with something that works pretty well and, for the most part, looks quite good. I'll try and improve the look & feel in future versions. Diffly needs a rating. Be the first to rate this app and get the discussion started! Diffly is designed to make it easy to browse a Subversion working copy and see all the changes, across all the files. You can filter out files you don't care about (e.g. externals) and sticky-select files for checking in. When it comes time to check in it's easy to review the changes for the files you are working with and assemble a detailed commit message and check-in. Diffly does not attempt to be a general Subversion GUI but is, instead, streamlined to make the process of browsing and committing simple, logical, and fast. It makes a good complement to a more sophisticated, but less focused, client like SvnX. I use Diffly and SvnX together but for my day-to-day work I prefer Diffly. Focused around core developer workflow. Browse changes across an entire working copy within an integrated browser interface. Convenient for selecting files, browsing, creating a detailed check-in message, then committing. See changes in a customizable Web view. Quick open files in FileMerge for more context. Open multiple working copies simultaneously. Remembers open browsers between invocations. Automatic updates using the Sparkle framework.